Portland has the immense good fortune to have the trifecta of tiki bar types: The high end in Hale Pele, the classic, mid-range with a Trader Vic's, and the vintage divey in the Alibi. But while the Alibi goes back to the 40s, hosts karaoke, and certainly does not have the craft cocktail chops of a place like Blair Reynold's Hale Pele, don't mistake the "divey" for some half-hearted tilt toward a theme -- the Alibi is a dark, adjust-your-eyes-and-drop-you-jaw, tiki wonderland. The building here is said to go back to the 1880s, when it was the "Chat-n-Nibble, a stop for horse and buggies along a dirt road called "the interstate." This would later become either Patton or Maryland Avenue (these were renamed Interstate Avenue in 1917). After prohibition it was a tiny tavern called "Max Alibi, which was owned by a Mr. Peterson and quite successful for several years. 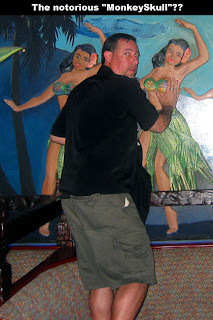 In 1947 Peterson sold it to Roy Ell, who turned it into a tiki bar, emulating the experiences he had enjoyed in Hawaii. 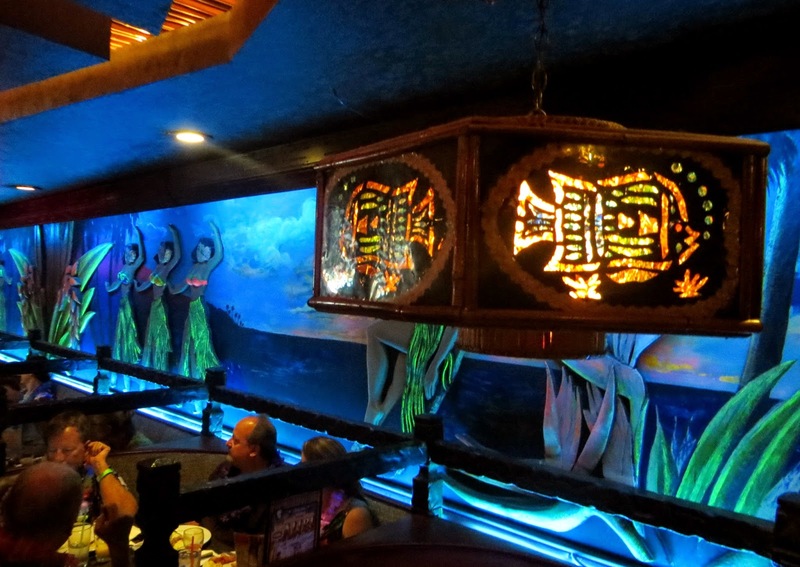 Over the years Ell expanded the place, engulfing a private home behind the tavern and a Texaco station next door to expand parking, as well as adding a restaurant section in the 50s and additional tiki touches, including the large, blacklight, hula girl bas-relief mural and Witco-style railings in the 70s. Ell leased the business out in the 80s with the stipulation that the decor not be altered, and eventually sold the place to Larry and Karla White in 1992. The Whites again refurbished the interior and rooftop sign in 2005, taking care to consult local tiki aficionados and preserve the vintage tiki style, despite no longer being required to do so. Larry White passed away in early 2013. 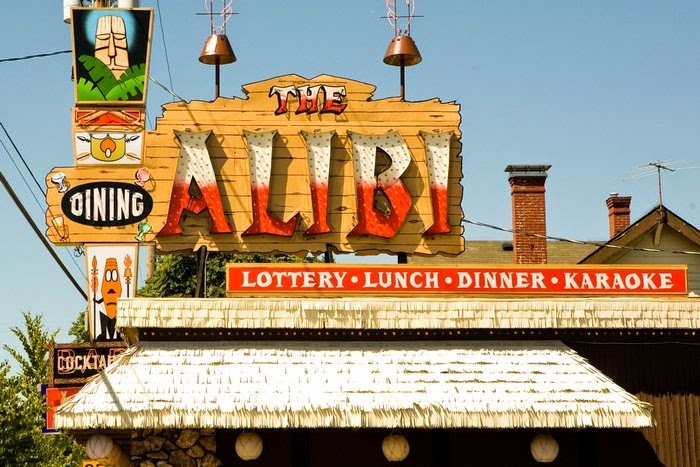 If you are a tiki fan, the Alibi is not likely to win your affections through their overly sweet drinks, the fairly standard bar food menu, nor the drunken karaoke singers. 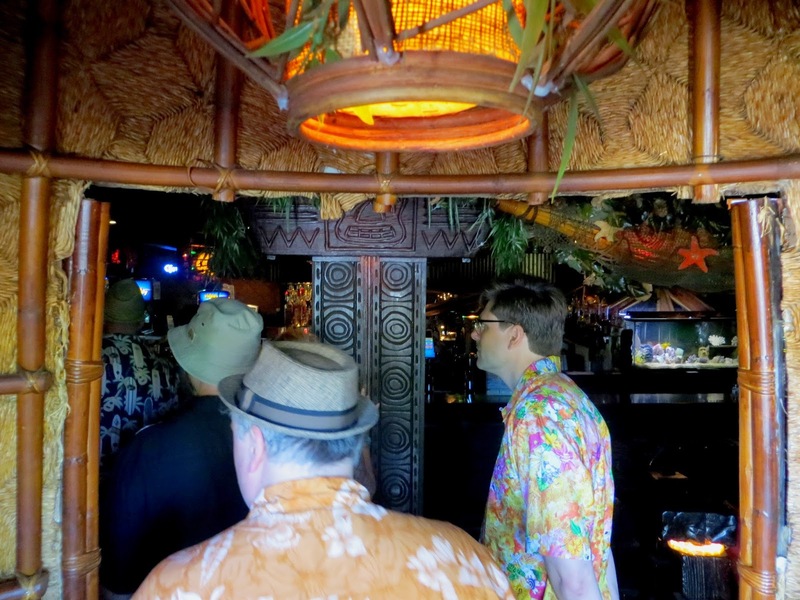 But it is exceedingly rare to see such a long-lived institution so devoted to its tiki decor, especially one that feels so unremittingly like a bar, without concessions to the restaurant area or sunlight. 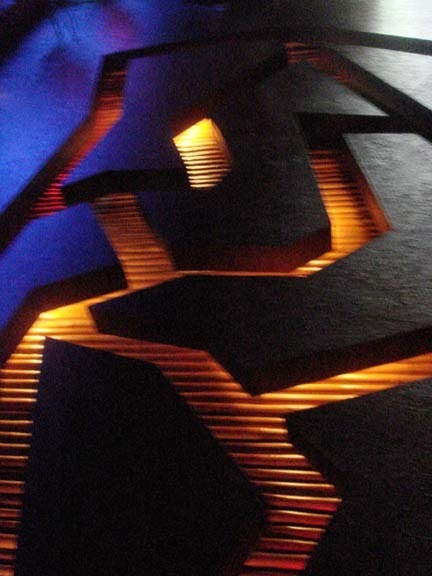 You enter through a thatch hut (mostly likely acquired from the old Kon Tiki) and, as your eyes adjust to the soft glowing lamps and fish tanks in the dark, you're never sure what lies around the corner. 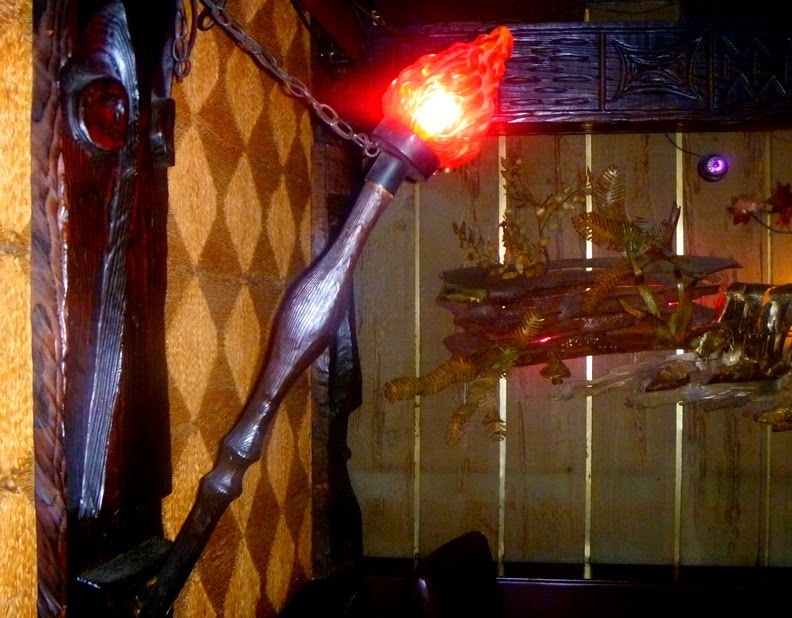 It is this stark transition from the bright, suburban America outside -- more pronounced than you were ever experience at, say, a Trader Vic's -- which makes this one of my favorite tiki bars in the country. 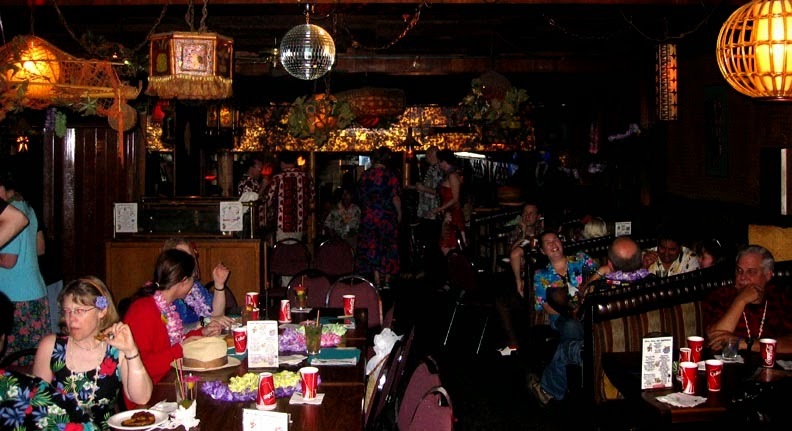 Especially with the closing of places such as Rosemead's Bahooka, I feel an abiding debt to Roy Ell, Larry White, the Portland area folks who helped clean it up and preserve it, and even the karaoke singers. Ahhh yes, that's how I remember him. I believe he still had his liver back in those days.